Would a laptop really work on Mars? There’s a lot of fantastic space-faring technology showcased in The Martian, the movie currently in theatres depicting Matt Damon as Mark Watney, an astronaut left for dead and stranded alone on the red planet. Much of it is based on real technology developed by NASA, and some is based on plans for technology that could be developed within a few years. Set in the very near future, this is one Sci-Fi flick that feels very realistic and close to our world. Our hero, Watney, even regularly makes use of a laptop – to log video journal entries, listen to a colleague’s disco music collection, and look up a hexadecimal translation chart. 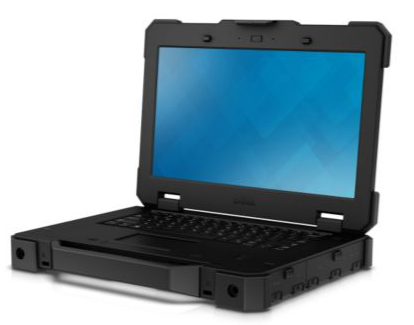 Dell’s Latitude Rugged Extreme 14 – could it withstand life on Mars? In the movie, the laptop is always seen in the climate controlled environment of “the hab” that becomes Watney’s Martian home. That should be fine, since the laptop is in conditions similar to that experienced on earth in that circumstance. Yet there’s one point in the movie where the hab loses its pressure. How the IT gear isn’t all fried is never explained, but in reality it’s unlikely it could survive. Each crewman had their own laptop. So I have six at my disposal. Rather, I had six. I now have five. I thought a laptop would be fine outside. It’s just electronics, right? It’ll keep warm enough to operate in the short term, and it doesn’t need air for anything. It died instantly. The screen went black before I was out of the airlock. Turns out the “L” in “LCD” stands for “Liquid.” I guess it either froze or boiled off. Maybe I’ll post a consumer review. “Brought product to surface of Mars. It stopped working. 0/10. What Weir is describing is the liquid in the laptop reacting to the lack of atmosphere on Mars. Because there’s no atmosphere, there’s no pressure, and therefore the boiling temperature of water is much lower than it is on Earth. NASA estimates that in the area where Mars’ pressure is at its maximum, the boiling temperature would be just 10 C.
The Dell Lattitude 14 Rugged Extreme will withstand some temperatures that you’d never want to put yourself in. It can drop to a frigid -29 C or withstand heat up to 63 C. That’s the operating range, and the laptop can even withstand temperatures as low as -51 C and as high as 71 C. Since the laptop is certified Mil-STD-810G certified, we know that Dell actually had to test the laptop for these specs. It’s actually possible that would be good enough to survive on Mars, depending on the season and time of day that it was exposed. The average temperature on Mars’ surface is -55 C, cold enough the laptop wouldn’t turn on, but not enough to kill it. But temperatures can drop to below -100 C in winter, which would certainly flash-freeze the laptop. On the other hand, if Watney were to take it outside in the height of a summer’s day on the equator, it’d be a balmy 20 C – no problem there. As if the lack of atmosphere and the sub-arctic temperatures aren’t bad enough, laptops on Mars would be subjected to super-charged particles shooting through space with incredible energy. Earth has its ionosphere to protect us from these dangerous particles, but since Mars doesn’t, anything on its surface isn’t shielded from these randomly-occurring rays. If a laptop were hit but these often enough, it’d wreak havoc on the LCD pixels and the other electronics. Dell’s laptop might be protected against electromagnetic interference – but being hit by a high-energy radioactive beam isn’t in the specs chart.